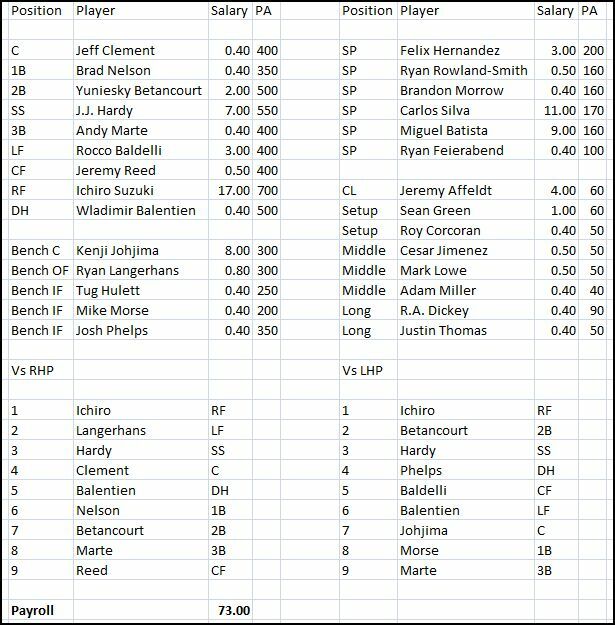 A few weeks ago, I presented a roster construction plan for 2009 that would allow the M’s to potentially compete for the division, going with a reloading rather than rebuilding plan. This is the exact opposite of that. This roster construction plan is something of a potential road map to rebuilding in a hurry, blowing up the current roster and attempting to win with a whole new core of players going forward. This team will be respectable enough, but it isn’t a 2009 contender. Instead, the focus is on finding players who can help in 2010, and limiting the losing transition to just one year. Here’s the team, and then explanations of how to get there will follow below. Two big trades bring back an all-star caliber shortstop, some interesting young talent at 3B, 1B, and RHP, and a power hitting left-handed first prospect. A couple of free agents sign with a team they know won’t compete for a chance to play a lot (Baldelli and Langerhans) and one for a chance to prove he can be a closer (Affeldt). The Mariners might not be able to offer a winning team, but they can offer opportunities that winning clubs cannot, and are able to bring in some capable talents to fill some key roles. This roster does several things – gives real chances to talented kids who may be able to show that they can contribute to a winning team in 2009. Nelson, Marte, Baldelli, Morse, and Phelps will get to earn increased playing time with production and health, and odds are that a couple of that group will show that they’re ready to be real contributors going forward. You’re buying low on a bundle of talent and giving them a legitimate chance to show that they’re capable of a full time job in 2010. This roster also significantly upgrades the defense, putting real athletes in the outfield, and while Marte is no Beltre, the upgrade from Lopez to Hardy is pretty significant. By getting better gloves on the field, you maximize the chances for success from the pitching staff. 2009 needs to be all about increasing the value of players in the organization, and Silva and Batista have nowhere to go but up. With better gloves behind them, you’re increasing the odds that one or both could have decent enough seasons. You’re never going to get them to be good enough to unload their contracts, but you might be able to get to the point where you don’t have to eat nearly as much money. If Silva’s pitch to contact style is backed up with good defense and he can run a 4.25 ERA, you could potentially be able to dump him next winter without having to eat more than $5 million or so. That would be a huge boon to the 2010 roster, and trying to coax some trade value out of Silva should be a priority for the 2009 team. In Adam Miller, you get a potential closer replacement for Putz if he can stay healthy. The arm is electric, but he needs to stay healthy. A rebuilding team can take a shot at a guy like that, and with Affeldt around establishing himself as a proven closer (and then getting flipped at the deadline for prospects), there’s no need to rush one of the young kids into the 9th inning role. On paper, this is probably a 75 win team, but it’s a 75 win team with some real upside, and one that will be building towards success in 2010. Just by sheer volume, you’d expect that the team will find a first baseman and a couple of outfielders who establish themselves in 2010, and you allow the kids like Valbuena, Tuiasosopo, Saunders, Halman, and Moore to get more experience in the minors rather than trying to rush them to usher in a youth movement. The team spends about $75 million on it’s 2009 payroll, and hopefully the new GM can convince the management to take some of those savings and invest them directly into the farm system, both in the draft and through additional international signings. It’s a rebuild with a purpose, and one that could set the team up for real contention in 2010. The new GM doesn’t need a five year plan – this rebuild can be done in one season, with a goal of winning again in just his second year here. If the Marlins make Jeremy Hermida available, would you prefer the JJ Hardy swap to one centered around bringing in Hermida + prospects? I saw Beau Mills play for Lewis Clark State. While it was against lower level talent and with metal bats, he could really hit the ball. One game 3 for 3 with 3 home runs. It will be interesting to see how he does at the MLB level. First of all I much perfer the blow it up plan compared to the attempt to compete plan. I used to go to school in buffalo and interned there and have other friends who worked rtheere and they said marte was a good person which is a big plus. Marte is a excellent fielder and while his bat is up and down I would love to have him I rather have sowers instead of miller but I really like the offer to the tribe. The move with the brewers I’m split on simply because I think we can get heilman and fernando martinez for putz and yuni. The mets need a closer and they hate heilman but I think we can make him a starter and since martinez is not ready and the mets are in need of a closer I think we can get him! But let’s start all over again and get armstrong out of here. I see very little lower level prospects in return for a team that’s blowing it up, but you did say this was to contend sooner. I understand the desire to improve the defense at all costs in order to have to pay less money on the remaining pitchers contracts if they improve enough…isn’t acquiring Griffey a safer bet to improve the bottom line? I don’t see how that makes it a good move either. If they can get rid of either Batista or Silva while getting something back (still paying most of what they’b be on the hook for anyhow) this year they really should. I have been pondering the idea a friend of mine proposed which was “If you’re not planning on contending and you really think you have a special player in Triunfel why not bring him up now and deal with his learning. You’ve been dealing with similiar frustrations up the middle and you’re going nowhere now. Half the players in the Hall of Fame developed this way and I’m tired of the argument that this is a bad way to develop players.” I told him that his clock would start sooner and you’d be likely to get leaner years during that time than if you waited until he was ready but it’s an interesting idea. Either way I’d rather not think about Lopez or Betancourt up the middle anymore. Lopez may have a future at 3rd and I believe in his bat continuing to improve, but I don’t think him or Betancourt is the answer at 2nd. If you’re keeping Betancourt around another year in hopes to improve his stock (though nobody has said they expect improvement in his abilities) Why not do the same with Lopez at 3rd who nobody seems to be saying has hit his ceiling? FWIW, Phelps was DFA on the 15th. Dang!!! Why aren’t you the new GM!?!?! ?